Markets are slightly higher this morning, responding to a bullish API report in regard to crude. Crude oil remained flat yesterday, closing only 5 cents lower than opening prices. Currently crude prices are $52.09, with a measly 21-cent gain (.4%) since yesterday’s close. 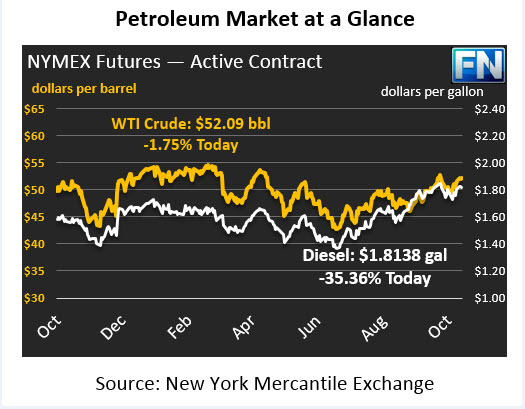 Crude has remained strong as prices have not dropped below $50bbl for more than a week. Refined products are following crude’s trend with minimal gains, despite a moderately bearish API report for diesel and gasoline. Diesel markets are up by only .0040 cents (-1.6%) to $1.8138 this morning. Like crude, diesel traded mostly flat during yesterday’s session before closing .0041 below opening. Prices have recouped all but one point of yesterday’s slender losses. Gasoline prices tell the same story, even with a bearish API report. Prices are $1.6376 currently, gaining only 75 points (.46%) since Tuesday’s close. Gasoline has traded flat overall this week, with a difference of only .009 cents between this morning and Monday’s opening price. Iraq government seized control over operations of the Kirkuk oil fields and the Kurdish Peshmerga (armed forces) agreed to return to pre-2003 Iraq borders, cooling Middle Eastern tensions for the oil markets. Iran announced plans to boost output as well as a “rough agreement” to extend the current OPEC production deal through 2018. However, we are still waiting to see verification of the agreement and further details, especially those concerning the inclusion of Nigeria and Libya. The API’s inventory report yesterday supported the slight gain in crude oil this morning showing larger than expected crude draws (7.1 API vs. 4.2 market expectation). However, after last week’s EIA data completely contradicted the API report, markets remain skeptical of the accuracy of the API’s data. Over the last three weeks, EIA crude inventories have drawn over 11 mmbbls, but levels still remain above the five year average by more than 80 mmbbls. API supported the bears in refined products with gasoline up by 1.9mmbbls and diesel by 1.6 mmbbls. Although as stated earlier, refined prices are not exactly reflecting the API report. Markets are looking ahead to today’s EIA data to verify the actual stats of supply and demand.